Here is a Flash presentation that shows before and after screenshots. Amazing. It's been three years since the last news entry. Three years since this project basically ground to a halt. And two years since this website originally disappeared. What is RetroFX? It is a library for use with emulation technology that permits the replacement of graphics, sound, music and more in a classic video game, with new modern-day equivalents. So basically, primitive "bleeps" can be replaced with full quality stereo sound effects, and low-resolution, low-color visuals can be replaced with high-resolution 16 bit masterpieces. The beauty is, the game logic and game-play stays exactly the same. So welcome back to the old RetroFX Ghosts n Goblins website! GameFan Magazine interviewed the RetroFX GnG team and published an article on us! The question on everyone's mind: Where is the demo?! We have very good reasons for delaying its release, as already stated before. We can't discuss the exact details, keep in mind that we are a very serious and dedicated group of talented individuals. We want to do this right, so all steps required to do so are being taken. We regret that it takes so much time. Our goal is to get RetroFX GnG in the hands of every GnG fan out there. We want everyone of every age to know about RetroFX GnG. We want the team to be proud of the end product. And we don't want lawsuits. So what is the beef with RetroFX ?! Where is that demo we promised several weeks ago ? I hate to keep you waiting, we have a good reason for this. You understand that our project not only involves game development but a whole number of other factors. Because of the amount of work we have invested we would like to evolve RetroFX into a professional team, which can make money with what we do, rather then doing all this for free. As soon as I have ironed out every issue, the demo will be posted (for free, off course ;-) ). Meanwhile, enjoy AntMan's Redesigning 2D Sprites in 3D special . I sincerely wanted to upload the demo tonight. At a last test-run of the demo I encountered some weird crashing-problem I hadn't encountered before. I want to fix this first. EmuGaming opened, offering a new gateway to all emulation and online-gaming needs. We wish Bomb' and his team all the best with this powerful combination. EmuGaming hosts a special RetroFX page, and provides us with a new forum. In the last weeks, EmuGaming's Fixo has been interviewing us and now you can read the fine results of his efforts here...I am sure you'll know us a lot better after that. Both EmuViews and Emugaming will host our demo. I found out last week that the demo weighs about 46MB now. We're very close to releasing the demo. Not only did Jose did an excellent preView on our demo, also Fixo made us proud of our work. Make sure you read these excellent articles, which contain some cool shots as well ! For those of you who don't know what Ghosts 'n Goblins is all about, check out my very own view on the original Ghosts 'n Goblins. We have been busy! Andre composed intromusic, AntMan created new artwork, Ray fixed some graphics and our man from Sweden, Martin created new soundfx, and I am the lucky one to put it al together :-). Other then that I have been preparing for the release of our demo. We don't plan on any ports to macintosh or linux now and the demo is 2D, so no 3D card is required. In case you have a 3D card, it is not used. In the forum someone asked me "I was curious as to once the library itself is finalized, how long does it take to RetroFX a game... Does it take literally as long as it takes to create all the subsituted content (backgrounds, new sprites, music, SFX, etc...) ?? or is there more to it..? " Yes, it takes litterally as long as to create all-new content. Now that the RetroFX library is becoming more mature, plugging in new material (audio, graphics, enhancements or new effects) is pretty easy. RetroFX-ing a game is a more game-development, then it is emulation. As a game-development idea it is strong : the scope of the project is well known (we don't change the essence of the game-design), the game-engine exists and is bug-free, and with RetroFX we can plug in our new material in a easy manner. RetroFX can be plugged in to any emulator, also multi-machine-emulators (like MAME). Is that useful ? For an emulator which supports a very small number or games, maybe... But for the 1000+ games MAME supports it is ridiculous. I have updated the technology and the gallery section. Emuviews will post a preView of the demo. I am proud to introduce you to our team, RetroFX. We are dedicated to innovate retrogaming and bring back to life classic arcade games in a way, never seen before. What we do is simple. We combine an emulated game-engine of a classic arcade game with new graphics, music, soundfx and effects. This way we bring back to life the game in a very new way. The new graphics and music are added with a library we created called RetroFX . This library contains the logic for all kinds of cool features which can easily be added to the original game. Features like parallax scrolling, smoothed animations, particle effects, blending, special sound fx... are almost no-brainers! RetroFX is applicable to 2D or 3D, and can transform a 2D game to 3D. For game-development, our approach has only advantages. By using an emulated game-engine, there are no worries anymore of having to write an engine from scratch. The emulated game-engine's behaviour is well known. Combining RetroFX with the game-engine, enhances the possibilities of the game-engine such that the game is improved, but not changed! Many of the revamped classics on the market today often lose the feel with their original so much, that the game completely loses its original appeal. This can't happen with RetroFX ! Our first project shows how we revamped Capcom's 1985 classic, Ghosts 'n Goblins (one of our all-time favorites). It's been an extremely intresting journey. Feel free to use our forum if you have questions or remarks. 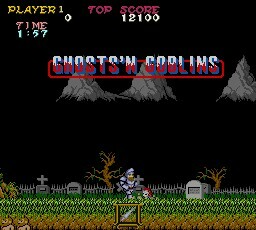 * Ghosts n Goblins is a trademark of Capcom. RetroFX is a trademark of Dirk Stevens. All content on this website copyright of their respective owners.